Refinery Catalyst Market is expected to reach USD 8.59 Billion by 2024 from USD 6.58 Billion in 2016 at a CAGR of 3.4%. 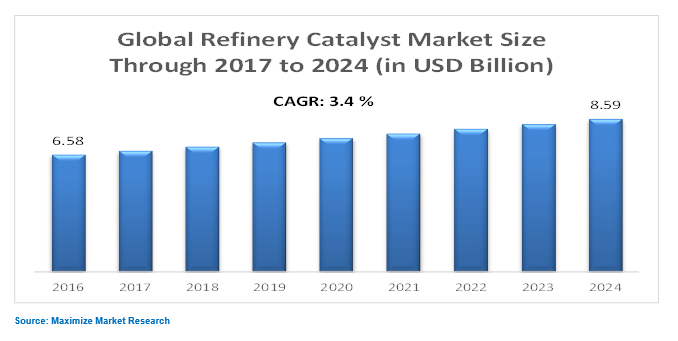 Escalating energy demand, environmental regulation, robust demand for catalyst in chemical synthesis, increasing demand for polymers, strong growth of refineries are factors driving the growth of refinery catalyst market. Undefined method of catalyst disposal and high cost of catalyst generation may restrain the growth of refinery catalyst market. Catalyst with improved and enhanced performance like zeolite is expected to impel the demand for refinery catalyst. FCC catalysts segment is dominating the refinery catalyst market during the forecast period. Increasing demand from the refining industry led by emerging countries, such as China and India and stringent environmental regulations are driving the growth of this segment. FCC catalyst plays vital role in the conversion of heavy atmospheric residues and vacuum distillates into fractions of motor fuels, mainly gasoline. Metals segment among material is leading the refinery catalyst market. Rising use of metals for hydrotreating and hydrocracking to remove unwanted impurities and emission of harmful gases into the environment due to stringent environmental regulations enacted to reduce air pollution by reducing sulfur content in gasoline and diesel. Asia Pacific, Middle East & Africa and Latin America. Asia Pacific is anticipated to grow at highest CAGR led by  increasing demand for transportation fuels, refined products and stringent environmental regulations in this regions. 8.3.2 W.R. Grace & Co.
8.3.9 Criterion Catalysts & Technologies L.P.
Silicon Carbide Fiber Market – Global Industry Analysis and Forecast (2017-2026) _ by Form, by Usage, by End-use Industry and by Geography.